There are many types of ventilation systems you could choose from for your roof. Ventilation is an extremely important part of your home. Not having the proper roof ventilation systems can not only ruin your roof but it can also leave your home feeling hot and humid all summer long. But with many options to choose from, how do you choose a ventilation system for your roof? Let’s take a look at how you should choose your roof ventilation system! What are Roof Ventilation Systems? Installing a roof ventilation system on your roof is essential. Properly ventilating your attic will help you feel your home cooler, save your home energy, and protect your roof from potential damage. 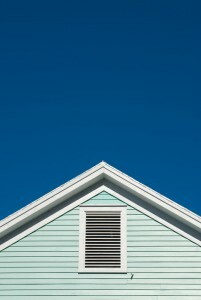 Installing proper ventilation can also extend the longevity of your home’s structure. There are actually two basic categories of ventilation systems: intake and exhaust systems. If you are thinking about a new intake system, one of the main vent systems is the soffit vent. Installing soffit vents around the perimeter of your home is an essential part of ventilating your attic. When installing these intake vents, make sure they are not blocked by insulation. The next category of ventilation system are the exhaust vents. There are several different kinds of exhaust vents for you to choose from. But when choosing an exhaust ventilation system, you should consider the design of your roof. A ridge vent is one of the most preferred types of exhaust vents but you have to have enough ridge on your roof for it to be effective. The vent is installed at the peak of your roof and takes advantage of the “hot air rises” theory. It is also one of the lowest-maintenance options available. Another option is a gable vent. These vents are more effective when they are installed with a fan to help push the air out of your home. Power vents are also an effective option but require more maintenance than other options. Power vents also run on electricity or solar energy to put the air out of your home. The final ventilation system for your home is the wind turbine. These are the second most popular option. Wind turbines can be installed on any roofing materials and are very long-lasting. There are many options for you to choose from for your roof ventilation systems. How will you ventilate your home? For more information on installing a roof ventilation system, call Absolute Home Solutions today! This entry was posted on Friday, May 13th, 2016	at 2:21 pm	and is filed under Roofing, Ventilation Systems . You can follow any responses to this entry through the RSS 2.0 feed. You can leave a response, or trackback from your own site.